I finally finished the Traveller's blanket- I felt I should have given it to my daughter ( were she interested in such things and if her suitcase wasn't bursting full with things that teens consider important) as she set off back to Australia last night from Frankfurt. Last weekend in Essen,Belgium, the Colours of Africa event was a well attended with lots of familiar faces coming through ( I know the faces, but the names- they always escape me) Sandy and I shared the space in the bottom of an old house - with wonderful high walls and good lighting. These four reddish pieces glowed with the light and gave a real sense of the intensity of colour of Australia. Then, because my daughters flight was delayed we headed back to Kolderveen- two days flew past and I am not sure what i did. I was supposed to have dyed fabric but I forgot to buy the soda ash on the first day. Then because of the delayed flight my daughter asked if we could please see Versailles and go shopping in Paris, so we went to Paris ( not exactly next door but even further away from Australia!- and I hate shopping). I love the stencil art you find around Paris. The photo below is kind of quirky as it shows three different human forms. And then off course there is Versailles. I am glad we went early in the morning- my goodness the amount of tourists there already at that time ...... and yes it's ostentatious and over the top but room linked into room- not too wonderful for privacy you would think. The Hall of Mirrors was magnificent though it was difficult to get a good picture what with jostling tourists ( yes I know I was one too) I have been trying to photograph tourists as they go into noteworthy spaces- I wonder whether the extended arm with a digital camera on the end will become a kind of icon of the digital age ? ?You know there are dozens of people in a room and all of their right arms or left arms are extended into the air? So here it is; the Hall of Mirrors, in which Marie Antoinette at the tender age of 14 married Louis the XVIth of France and sealed her fate- though sealing her fate suggests she had a choice in the matter, perhaps I should have said Marie Therese of Austria sealed her very pretty and bright daughters' fate. And last but not least a Cherub pointing whither?- what will the winds carry? I started a large collaged piece to showcase the Aurifil threads- but at every stage I have thought is it worth it.I have used the 28 weight thread cotton mako- and loving it! 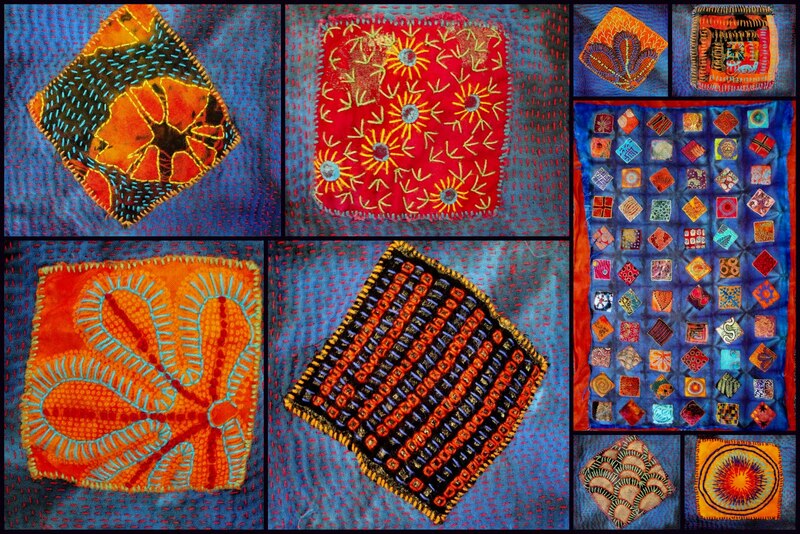 I have been making whole cloth quilts or hand stitched pieces these last 18 months and to suddenly use lots of bits of fabric has created a bit of uncertainty. I am also a bit limited by my pallete- not having that many fabrics with me- I possibly used more purple than I would ordinarily- though the piece looks more purply than it is in actuality The photos show the various stages. Stage one is collaging the fabric, stage 2 putting in the stitched lines to add more definition, and finally the free machine stitching to enhance elements.The piece is about 90 cm square so the stitching is taking ages... It is still not quite finished , and I should finish it tonight, but the last half hour or so I have been fighting with the machine so I think it's time to call it a day for the time being. As you can see on the last photo the stitching is heavy- but is it worth it? I have been working hard on my travellers blanket- hand stitching , embroidering the last 30 or so squares.I have been sitting up untilmidnight stitching- which is somethign I don't normally do much stitchingat night as it is also my daytime job. I really want this piece finished all of a sudden. I have this need to have it finished and out of my life. However that is not to say that I won't make another one. I am already planning another one- getting the right fabric is another matter though- as I have used bump ( heavy weight flannel) as the batting and that is really important for it's suppleness, ease of stitching and drape.I did purchase some Ethiopian light weight hand woven cotton from Maggie Relph from the African Fabric Shop to dye for the top layer ( Maggie will also be in Essen next weekend with her shop) As you can see from the image- the piece is very heavily stitched or is it embroidered? It is six embroidered squares wide and 11 long and each square is about 1 metre wide by about 1.6 metres long- that's a lot of stitching!!! I had wanted it finished last February 2009 but life intervened. I feel the urge to start another for a new phase in my life- hopefully a happier phase- though the colours in this blanket are really cheerful- perhaps it is telling me something! 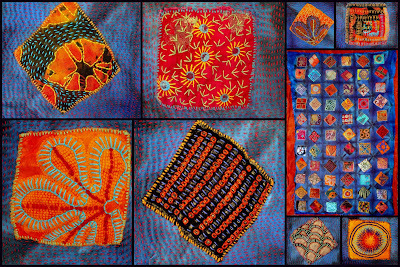 I also want the travellers' Blanket finished for the Colours of Africa exhibition at Essen next weekend as part of the Kunst Route ( art route) that Laura Liebenberg has organised. Please come if you have the time- there will be exhibitions a small but wonderful market place and an auction of textile pieces made to raise money for a safe creche for childrren in South Africa. I have been hand stitching all weekend- somehow it did not seem right to machine stitch. And today I intend to make another linocut so i can make some small pieces for the Colours of Africa exhibition in Essen next week. The trouble is when you sit and stitch it can sooth, but it can also set you to thinking and right now I am worrying about making my European dream work. I really need to shore up more work/workshops- at present i do not have sufficient work lined up.Sales of quilts are down and I am in the process of getting more books printed ( 72 ways and 72 MORE ways). I need to make more little work but haven't had the machine to do that- I need to get busy this week! I am in the Netherlands until 2 May and am available for workshops ( except for 26/27 April). I am also close to the German border ( well i think it is close) so if anyone is interested until 2 May please let me know. 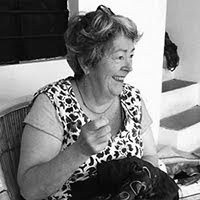 On 3 May i head back to Montpellier and will be there until 13 May when i go to Syria with Creative Arts Safaris. I get back from Syria on the 28th of May and am then available to do workshops anywhere- though I am teaching at Leysin in Suisse from 16-19 June ( and there are still places available in that workshop , we will be very creative !). If any of my readers are at all interested in workshops please email me! I have a workshop information sheet I can send out. I have finally finished a machine stitched piece- I can't tell you how relieved I am to be finally stitching on a machine again. My friend Christine Moulin lent me her second machine for the month whilst I am using this studio and it happens to be the same machine as the one I used back in Australia- so the machine is getting a working out! I needed to make two more works for Southern Lands- and this one i s inspired by one of the creeks in Jerilderie where we used to swim before they built a swimming pool. The waters were always dark in summer because of the tannin from the gum leaves. I was always worried about snakes in those dark waters! Thi spiece measures about 50 cm by 135 cm- and it took a lot of stitching. In a sense I am beginning to wonder is it a quilt or is it an embroidery? The entire piece was stitched with Aurifil threads- who have been kind enough to sponsor me with threads whilst I am in Europe. The image above is of the studio space in which I am working at the moment. I need to work really hard these next four weeks- there is a lot of work to make!But as you can see it is a really light space with little clutter.